Help Turtle Hope WWF Project - Why We Need to Save Sea Turtles? 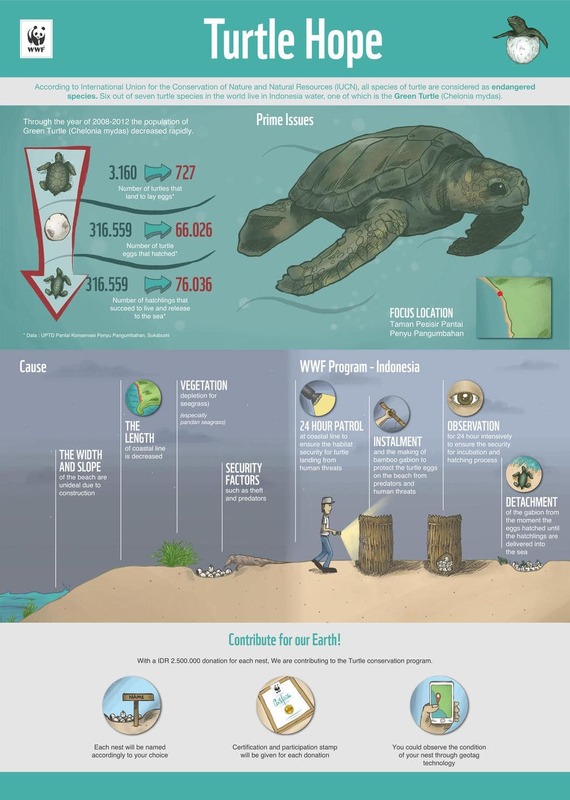 You are here: Home / Help Turtle Hope WWF Project – Why We Need to Save Sea Turtles? According to International union for the Conservation of Nature and Natural Resources (IUCN). 6 out of 7 turtle species live in Indonesia waters. One of which is the Green Turtle Through the years of 2008-2012, the population of Green Turtle decreased rapidly. 1. Sea turtles often act as keystone species. 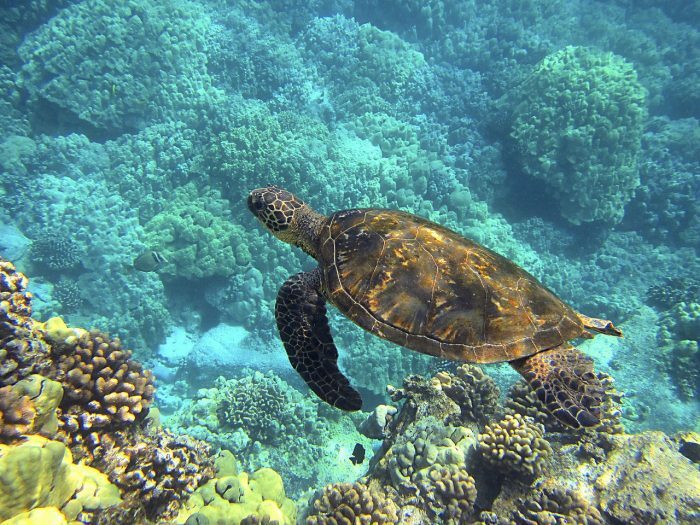 Sea turtles, especially green sea turtles, are one of the very few animals to eat sea grass. 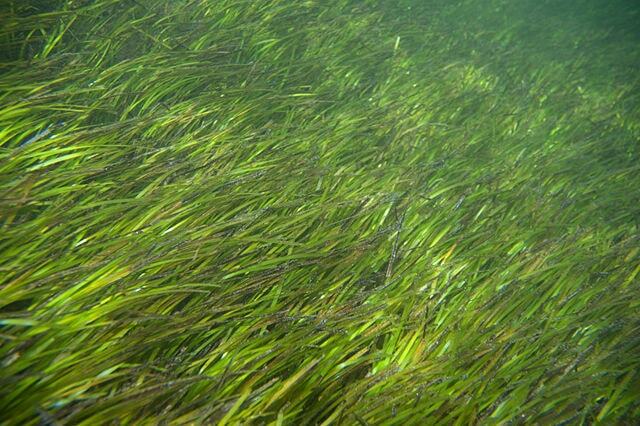 Sea grass beds grazed by green sea turtles are more productive than those that aren’t. Hawksbill turtles eat sponges, preventing them from out-competing slow-growing corals. Both of these grazing activities maintain species diversity and the natural balance of fragile marine ecosystems. If sea turtles go extinct, it will cause declines in all the species whose survival depends on healthy seagrass beds and coral reefs. That means that many marine species that humans harvest would be lost. All parts of an ecosystem are important, if you lose one, the rest will eventually follow. Beaches and dune systems do not get very many nutrients during the year, so very little vegetation grows on the dunes and no vegetation grows on the beach itself. This is because sand does not hold nutrients very well. Sea turtles use beaches and the lower dunes to nest and lay their eggs. Sea turtles lay around 100 eggs in a nest and lay between 3 and 7 nests during the summer nesting season. Not every nest will hatch, not every egg in a nest will hatch, and not all of the hatchlings in a nest will make it out of the nest. 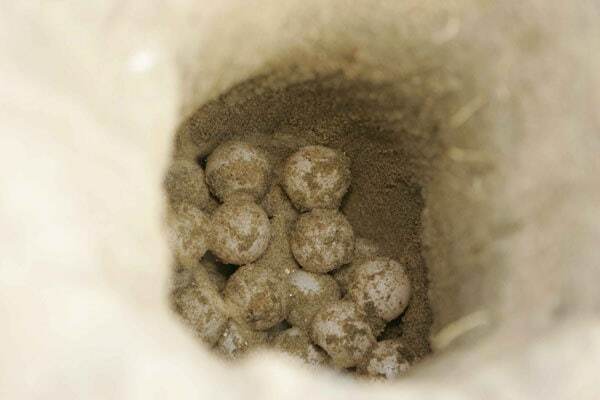 All the unhatched nests, eggs and trapped hatchlings are very good sources of nutrients for the dune vegetation, even the left over egg shells from hatched eggs provide some nutrients. Dune vegetation is able to grow and become stronger with the presence of nutrients from turtle eggs. As the dune vegetation grows stronger and healthier, the health of the entire beach/dune ecosystem becomes better. Stronger vegetation and root systems helps to hold the sand in the dunes and helps protect the beach from erosion. As the number of turtles declines, fewer eggs are laid in the beaches, providing less nutrients. If sea turtles went extinct, dune vegetation would lose a major source of nutrients and would not be as healthy and would not be strong enough to maintain the dunes, resulting in increased erosion. 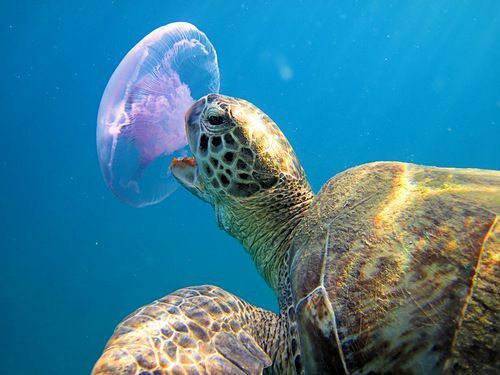 Sea turtles eat jellyfish, preventing the large “blooms” of jellyfish – including stinging jellyfish – that are increasingly wreaking havoc on fisheries, recreation and other maritime activities throughout the oceans. How can you get Discount ? is it a Scam ? 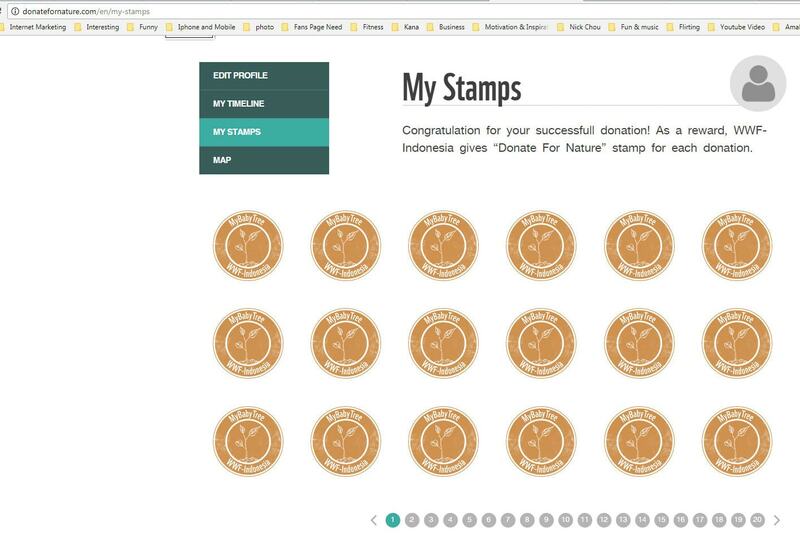 Does Earthbuddies also donate for Turtle Hope Project ? Yes , earthbuddies has been donating to turtle hope and my baby tree project in the past . we have an account too. visitor can get special price to adopt tree/ turtle nest ( with currency differences. Earthbuddies has contact WWF-ID and have approval for this matter.